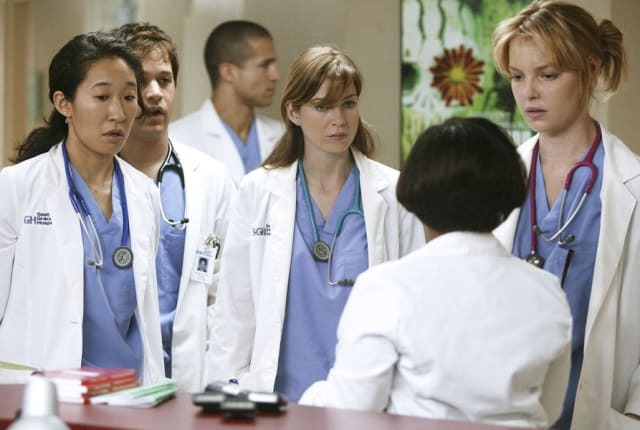 Watch Grey's Anatomy Season 1 Episode 1 online via TV Fanatic with over 7 options to watch the Grey's Anatomy S1E1 full episode. Affiliates with free and paid streaming include Amazon, iTunes, Vudu, Netflix, YouTube Purchase, Google Play, and Verizon On Demand. MEREDITH: [to Derek] "Stop looking at me like that, like you've seen me naked." Permalink: Stop looking at me like that, like you've seen me naked. IZZIE: "Hi! I'm Isobel Stevens, but everyone just calls me Izzie." MIRANDA: "I have five rules. Memorize them. Rule number one, don't bother sucking up. I already hate you, that's not gonna change."